December 20th, 2015 posted by mike under Artist Profiles. Derry deBorja has played in bands like Canyon and Son Volt, and now plays keyboard and a Therevox ET-4.3 with Jason Isbell and The 400 Unit. 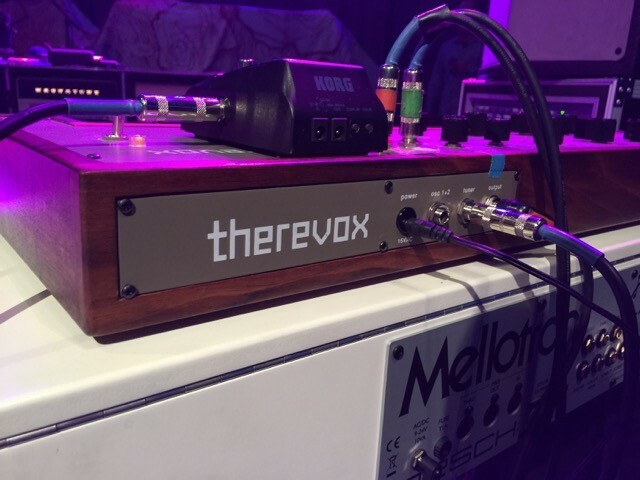 Therevox: How long have you been playing with Jason Isbell and The 400 Unit, and how did you get started playing with those guys? Derry deBorja: I’ve been playing with Jason for almost nine years now. We met back in 2006 during a co-headlining tour featuring our former bands, The Drive-by Truckers and Son Volt. I remember the first night of the tour, walking circles around the block of the music venue making phone calls. Jason was doing the same, but walking the opposite direction. Every time we’d pass, we’d nod at each other and continue on our way. We did that three or four times before finally putting our phones down and introducing ourselves. We became good friends during that tour. When Jason was ready to leave The Truckers and go solo, he gave me a call. The 400 Unit’s had a few lineup changes over the years. The current lineup features Jimbo Hart on bass, Chad Gamble on drums, Sadler Vaden on guitar, and yours truly handling keys. We’re headquartered in Nashville, although half the band resides in Northern Alabama. You guys recently did a four-night stand at The Ryman Auditorium in Nashville, how did that go? 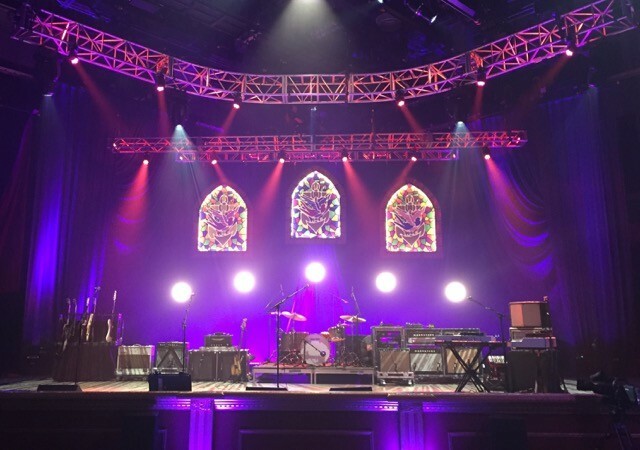 Completing a four-night, sold out stand at The Ryman Auditorium meant a lot to us. Nashville’s served as our home base for a few years now, so it’s really inspiring to see that level of “hometown” support. I count myself very lucky knowing I’m part of something that resonates with so many people. It’s really a good feeling. How would you describe the music scene in Nashville? I’ve never been part of a scene that is so active and vital as Nashville’s. There are so many people involved in making music here—so much being produced or being performed at any given time. I never feel like my job is done when I come home from a run of shows. The air around Nashville is constantly reminding me that there’s always more to experience and more to accomplish right here. Last year you guys recorded a cover of Beck’s “Now That Your Dollar Bills Have Sprouted Wings” from his Song Reader album, which was released as sheet music only. Can you explain the process of turning sheet music into a song? Turning sheet music into song is much like taking a studio recording and bringing it to life for a live audience. It’s all about expression and impact. You can play the notes on the page, but they don’t necessarily mean anything if the performance isn’t grabbing hold of the listener. From chord progressions to arrangement choices, the Song Reader material is laid out very traditionally. Going in to the studio, we knew we wanted our cover to break out of that mold. That took a lot of experimentation. We threw a lot of ideas up against the wall to see what would stick. Then we’d tear down that wall, build a new one, and throw even stickier ideas against that one. The process was a lot of fun and the end result was something no one in the band or even our producer expected. What made you choose to use the Therevox on that song? There is something inherently “rootsy” about the Song Reader material and we wanted our cover to break away from those leanings. Sonically, the Therevox fit the bill with that in mind. I mean, it’s not an instrument you typically see at Americana festivals. What other songs do you use Therevox on, and what sort of parts do you use it for? 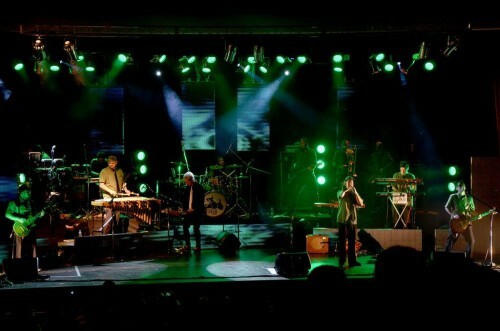 I never intended to use the Therevox live on stage. I used to set it up before soundchecks just to have something to fool around with as the stage was being set. But after a week or two, we started leaving it set up during our performances. Parts for songs would develop from there—from short melodic lines that hint at lap steel to gigantic, otherworldly atmospheres. The Therevox is such a versatile instrument in that regard. There are Therevox parts scattered throughout our live set. “Never Gonna Change” (a song Jason wrote during his tenure with The Drive-by Truckers) features an atmospheric line that takes advantage of the Therevox’s beautiful built-in spring reverb. The intro to “Super 8” (from 2013’s Southeastern) features a low-end rumble that can shake a music venue down to its foundation. Perhaps my favorite use of the Therevox is in “Songs She Sang In The Shower” (also from Southeastern). The hold knobs on my ET-4.3 allow me to create a drone during the second verse while my hands are busy playing other keyboard parts. What other instruments do you play with this band? I’ve always got a bunch of keyboards in front of me during Jason Isbell And The 400 Unit shows. My current setup features the Therevox ET-4.3, a Nord Electro 5D, a Mellotron M4000D, a Mellotron M4000D Mini, a Hohner Anacleto accordion, and an Electron Octatrak. Do you use any effects with the Therevox? I do. I’m running a Moog Minifooger Boost and an Earthquaker Devices Disaster Transport delay through my ET-4.3’s effects loop. They sound great through the Therevox’s built-in spring reverb. The Moog Boost pedal has a ladder filter built into it that gives me extra tonal control when used in conjunction with the Therevox’s own LP filter. You play on Jason’s fifth studio album, “Something More Than Free”, where did you guys record and what was the process like? We recorded the majority of “Something More Than Free” at The Sound Emporium here in Nashville under the watchful eyes and ears of Dave Cobb, our producer. Additional recording, overdubs, and mix were handled at Cobb’s own studio, Low Country Sound. The entire process was short, quick, and easy. We’d averaged about 1 1/2 songs a day over a couple weeks. I barely remember, it happened so fast! I believe it stands as a testament to the talents of Jason as a songwriter, the talents of our producer, and the talents of a band that has played so many shows together over the past nine+ years. We’re really a family at this point. We have a novel’s worth of in-jokes no one outside could possibly understand. What do you do when you aren’t playing music? I fell down the modular synthesizer rabbit hole a little over a year ago. A lot of my free time has been devoted to building one and studying it’s potential and uses. It’s a very deep rabbit hole. The rest of my free time I spend avoiding butterflies and cold weather. October 27th, 2014 posted by mike under Artist Profiles, Videos. 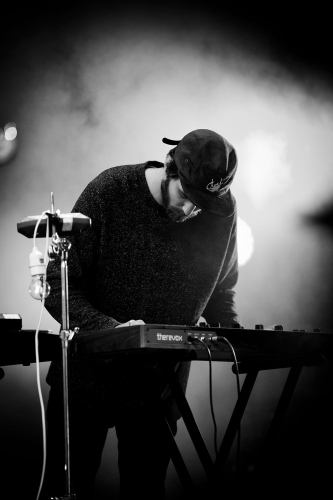 Simen Skari plays Therevox and keyboards in Norwegian indie band Team Me, whose new release is called Blind as Night. Therevox: How did Team Me get started and what are some of your influences? Simen Skari: Team Me started as Marius’ solo project, with a bunch of songs that didn’t fit into any of his other bands. One of his songs got picked for the finals in a demo competition, where he had to play some songs live. Afraid to perform alone, he asked some friends to join him. I guess we were lucky enough to have the right people in the audience, so one thing led to another. It´s sort of a full time project now. We’re a six piece with a lot of different influences, and we listen to anything from Norwegian black metal to hymns. For me, I would say that I’m above average interested in and inspired by Radiohead. That’s how I got introduced to the Ondes Martenot, (with Thom Yorke, Jonny Greenwood and Nigel Godrich performing a stripped down version of Thom Yorke´s ‘Cymbal Rush’ on Henry Rollins Show in 2006 , the French Connection and eventually the Therevox. Where and how did you guys record your new album “Blind as Night”? Quite a few places! We started the recording a year ago in an all analog studio called Athletic Sound. It’s an old gym with really nice acoustics. Perfect for recording drums! We then went to our hometown and recorded all that remained in an old barn, next to our house. We recorded and produced it ourselves throughout the autumn and winter, alongside co-producer Hasse Rosbach. I guess the only plan we had was to make it as big as possible. How does the band build a song, and were the songs fully rehearsed before going into the studio? Marius made all the demos, and some of them were even made while touring. It feels like we spend 99.99% of our tours in our car, driving from country to country, so making demos is a good way to kill time. Oh, and I’ve got to say that he is the most productive person I know. For this album, he presented over a hundred different song ideas to the rest of the band. We sat down and chose which songs we liked the most, and started recording them. In the studio, we kind of tore the demos apart, started from scratch and built it all up again together. Then everything was recorded separately. I believe there’s over a thousand layers of sound in some of the songs. For instance, we used 18 different microphones to record one single tom… I guess that was an experiment led by our producer though.. And then there are four layers of bass guitar, bass synth, strings, horns, guitars, a lot of vocal harmonies, children’s choir, drums, percussion, melodic percussion, synths, pianos, bicycle wheels, farts, and the list goes on and on forever.. Speaking of farts, we actually recorded a lot of them, which I sampled and placed on my keyboard. So now I have the whole chromatic scale of farts. I guess that’s why the recording session went on for about a year.. haha. What instruments do you play on “Blind as Night”? Basically whatever we could find around us in the studio! We’re just trying to make the recording session as fun as possible, so I guess we don’t want to be bound to certain instruments. And when you try a new instrument, magic happens 🙂 But mainly we play the instruments we play live, which for me means keys. I’ve been using some weird old synths, grand piano, the French Connection and the Therevox amongst other things. What song(s) do you use your Therevox ET-4.3 on and why did you decide to use a Therevox on those songs? 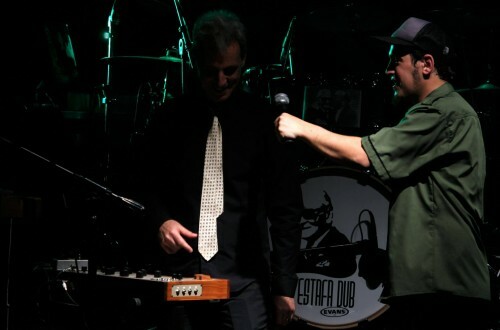 Actually I wanted to use the instrument on every track, haha! I think there’s something quite unique about the Therevox. The way you can express yourself through the instrument is just different from any other electronic instrument. And I’m totally in love with the sounds it makes. It reminds me of old sci-fi movies, and how it’s spooky in a beautiful way. I’ve used it for the opening track, a couple of sonic landscapes between some of the songs, and on some of the b-sides. I didn’t discover the Therevox until very late in the recording session, so for this album I’ve mainly used an Analogue Systems French Connection, with a bunch of nice modules, some tape machines, all through a little gibson skylark amp from the 50’s. I’ve used it on 6 out of 10 songs on our album, and on some b-sides. How would you describe the music scene in Norway? I guess our long, dark and cold winters have affected the Nordic music scene in a way. For instance, I can’t imagine black metal could have originated in sunny Hawaii. The last couple of years it seems like there has been some sort of a shoegaze movement in Norway, with one in two of all new bands joining the genre, or subgenres of that. Some of them, Dråpe for instance, quite more pop oriented than shoegazed, have the most beautiful songs and melodies. Some other Norwegian bands I enjoy listening to these days are Farao , Electric Eye, Twin Pines Mall, Ludvig Moon, Aphotek and Emilie Nicolas. And, though I’m highly disqualified, since I’m her boyfriend and sometimes appear in her live band, I really love ANANA’s music. That’s one of the reasons why I got interested in her in the first place. Haha! Another band I really admire, with some of their members actually joining us for parts of the recording of our album, is Jaga Jazzist. One of my all time favourite bands. The music scene in Norway is quite small, and everyone and every band is connected to each other in one way or another, and there’s a lot of tasty and inspiring things going on. What are you guys doing when you aren’t playing music? We’re all involved in other bands, and have part jobs here and there. I work as a graphic designer, which is perfect while touring, because all I basically need is my laptop! I try to do some film stuff as well. You also did all of the artwork for the new CD, can you tell me a bit about the process you went through to create it and how you arrived at the concept? Every time I visited my grandmother during my childhood, I dived into these beautifully illustrated theory books. For a long time I have wanted to use them in a project. Usually I just work digitally, but I always tend to make it look analog in a way, like it’s made by hand, it’s screen printed or whatever. So this time I borrowed these books from my grandma, which I basically cut into a million pieces. Then I built a three dimentional collage out of it, lighted it up and took some photos of it. It resulted in a 16 page CD book. Our music has become a bit more dark and heavier in some way, compared to our debut album. So I’ve basically just tried to create something visual to enhance the listeners overall experience of the album. What’s next for Team Me? February 19th, 2014 posted by mike under Artist Profiles, Videos. In this video, Mark plays a 4-part Bach Chorale using his Therevox ET-4 for every voice. We got to ask mark a few questions recently about his gear. Therevox: As someone who has lugged a Hammond and Leslie to a gig, can you explain the importance of playing the “real-deal”? Mark Calcott: There’s something special about playing the real thing. You can feel the richness and warmth of the sound shake your whole body. Even though it’s an electric instrument, the sound is very organic. Go play a 9′ Steinway for a little bit, and then try to tell me that your software piano is the same thing. It’s not. The experience of hearing, and feeling those long strings resonating right in front of you is part of the experience of the a real instrument. The same thing goes for the harpsichord. You feel the strings vibrate in a different way than you do coming from a set of speakers. The action of the harpsichord is also very important too. You can feel the resistance of the plectra beneath your fingers on the real instrument. You recently acquired a Harpsichord in Detroit, any other interesting gear acquisition stories? Man, I love Detroit for odds and ends like that. I bought that harpsichord for $225, and brought it back home in my station wagon. About 2 years ago I found someone who was selling an Optigan for $100.When I went to test it out, it lit up, but barely made a sound. I ended up getting it for $20. When I brought it home, I let it warm up for a bit, and it started working for me! Most recently, although not a cool keyboard, I acquired an original 1980/81 “Gorf” arcade. What are some of the instruments you find yourself going back to often and why? 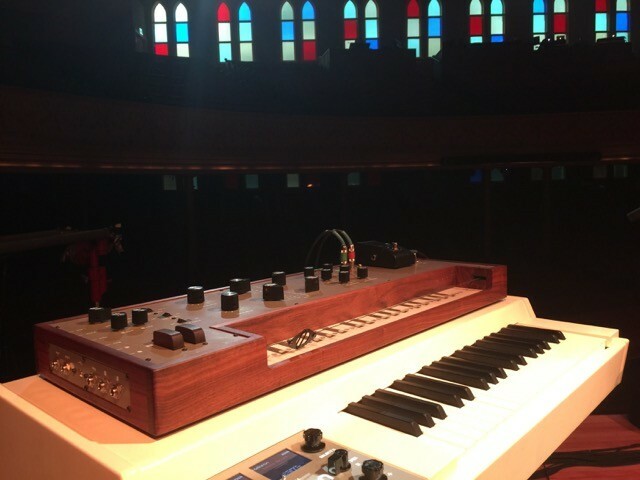 Piano, and organ. Particularly, the sound of the Hammond organ. I recently sold my Roland Fantom G6 to offset the cost of a Nord C2D. I use the Nord in place of my old ‘brass’ or ‘wind’ instrument samples. It just sounds better. You have been playing Therevox for over a year now, can you talk a bit about the learning curve or maybe share some pointers? When I had to learn Good Vibrations, I remember having to practice my octave jumps many times. Since then I have noticed that any big jump over a 3rd or so, is going to require some rehearsing, if you want to land on your note consistently every time. Make sure you are actively listening. It’s very easy, and irritating, to be just a little out of tune! Where does your Therevox ET-4 fit in to the music you make? So far, I’ve been using the Therevox mainly for my own relaxation. I like to zone out with it, and explore its sounds when I’m feeling stressed. It’s just so expressive, and pulls you in, that you forget about life for a while. I’ve used it on a few gigs, one of which had me playing the obligatory Good Vibrations lick. It was a lot of fun. I’ve also used once with Huladog. Mainly though, it is a studio instrument for me. What musical projects are you currently working on? the Bad Mothers, Dream Catcher, Huladog and James Gibb.